The Village Playhouse opened its production of Dawn King’s Foxfinder last week, a Canadian premiere directed by Nicole Arends. A hard rainstorm threatens the Covey farm’s already compromised crop quota for the year. And adding to the Covey’s distress is the impending arrival of a man sent to audit, assess and judge the conditions on the farm – and their fitness to run it – and they’ll be playing host to him for the duration. Foxfinder is set in a present-day reality in which society runs with bygone methods of farm and factory production – and where the governing authority micromanages it all. Weather patterns have been changing, threatening food production and the very survival of civilization. This is a world of suspicion, superstition and right wing-style religious fervor over the land and its protection. And the fox has become the demonized scapegoat, to blame for everything from failed crops to the evil that men do. The four-person cast does a nice job of bringing this world to life. Bronson Lake gives a strong, brooding performance as Samuel Covey, a good, hard-working farmer, and man of few words and no complaint as he struggles with damaging weather and family tragedy. Beneath his solid character is a man desperate for reasons and answers. As Samuel’s anxious young wife Judith, Holly Easton is the heart of the family-run farm; an equal to her husband, and lost and mourning in her own way even as she strives to carry on with growing their crops and their family. Michael Pearson brings an eerie, cold calm to William Bloor, the rookie Foxfinder sent to assess the Covey farm; an earnest, formal and fastidious young man, he too is conflicted – committed to doing his duty while struggling with inner demons of his own. Naomi Peltz brings a wry-witted warmth to the cynical Sarah Box, the Covey’s neighbour and Judith’s best friend; pragmatic and suspicious, she too has some hard decisions to make. Foxfinder is an interesting – not to mention intense and spooky – exploration of how the human need and desire for reasons and meaning can be manipulated by the powers that be to control society through the systemic and dangerous assignment of culpability and blame. With big shouts to Arends (with Gilles Gagnon and Dustin Woods-Turner) for the beautifully wrought and evocative sound and projected image (with Fotini Paraschos) design. The imaginative and effective staging includes an upstage screen, which is used for both projected images of the farm and its environment, and to present bedroom scenes, where the characters are shown in backlit silhouette. Witch hunt meets climate change conspiracy in the Village Playhouse’s haunting, dystopic Foxfinder. Foxfinder continues at the Village Playhouse until March 19; check here for full performance date/time info. Tickets can be purchased 45 minutes before curtain time at the box office; or you can call ahead to reserve: 416-767-7702. 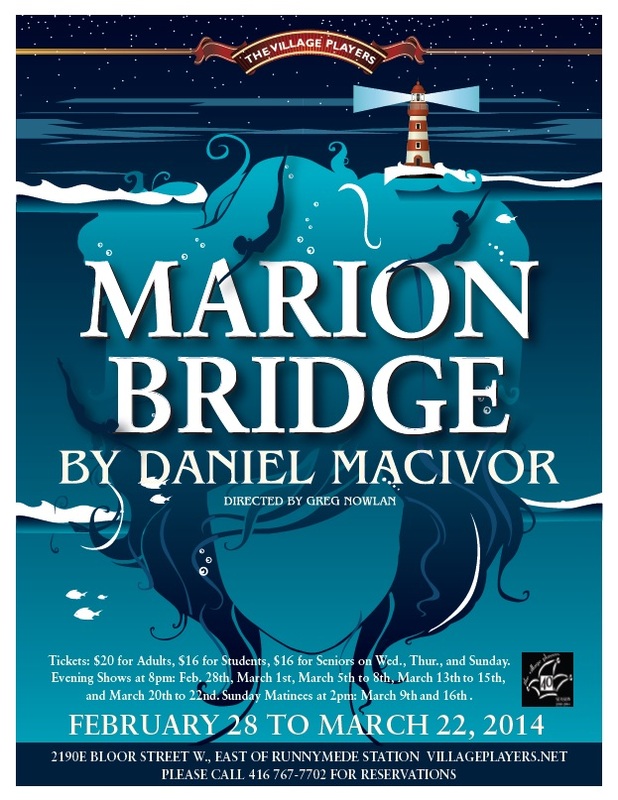 Dropped by the Village Playhouse on Sunday afternoon to see the Village Players’ production of Daniel MacIvor’s Marion Bridge, directed by Greg Nowlan. Three sisters reunite at their Cape Breton family home to be with their dying divorced mother: Agnes, a struggling actress who’s been living in Toronto; Theresa, a nun whose order runs a farm in New Brunswick; and Louise, who stayed at home. Family history and present-day challenges converge in this funny, touching play – told with humour, honesty and heart. Returning to the stage after a 10-year absence, Michelle D’Alessandro Hatt gives an outstanding performance as the fiery, strong-willed – and at times petulant – oldest sister Agnes, the “unconventional girl” in the family, struggling with alcohol and an acting career that’s going nowhere and leaving her broke. Lorene Stanwick does a lovely job with Theresa, the cool-headed, responsible middle sister, a wry-witted and sensitive nun facing personal trials of her own. And Anne van Leeuwen is delightful as the “strange” youngest sister Louise, child-like, straight-talking and longing to belong. All three actors do a stand-up job of capturing the sibling dynamic, at times shifting into childish interaction, the sisters’ individual roles in the family set long ago. All three sisters are lost, searching and bracing themselves for the coming loss. Kudos to voice-over performers Erin Jones and David Borwick for their portrayals of Kara and Justin, two characters from the fictitious soap Ryan’s Cove, a favourite TV show of Louise’s that becomes a sibling diversion. Marion Bridge is nicely staged on a minimalist kitchen set (designed by Steve Minnie) that evokes the place, and lets the actors and action take prominence – and filled with a beautiful, lyrical regional soundtrack (designed by Richard Green), including, of course, “Song for the Mira” at the end of the play. Life, love and loss with three feisty Cape Breton sisters – the Village Players’ Marion Bridge is a lovely bit of storytelling. Marion Bridge continues its run at the Village Playhouse this week Wed – Sat (closing Mar 22). Sunday was sold out, so I’d book ahead if I were you: 416-767-7102.